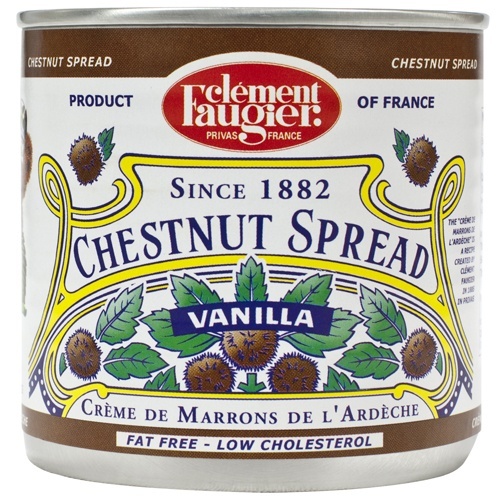 100% natural chestnut spread from Ardèche, sweetened with sugar and natural vanilla. This is the same recipe since 1885! Color: brown. Lightly sleeved, thick and creamy consistency. Chestnut (50%), Sugar (47%), Glucose syrup (1.09%), Crushed candied marrons (1%), Water (0.9%), Vanilla natural flavor (0.01%). There are many ways to enjoy it! Ready to be used straight from the tin, it can be savoured with plain yogurt. It is also delicious spread on cakes or on fruits. But the most notorious and classical ways to relish it is when used as a topping on bread, pancakes or waffles. 5 years after the date of production. Size (in): L 13.8" x W 10.4" x H 6.7"